Cley is a small coastal village and, as a result, has very limited parking. 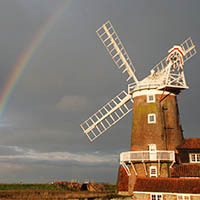 The Car Park adjacent to the Windmill belongs to Cley Parish Council and our guests are very welcome to park there for free. 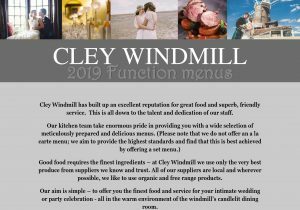 However, we would ask you to park with due care and consideration and as close to the next car as possible in order that Cley residents and visitors also have room to park there. We would ask that at all times the slipway remains totally clear for safety reasons as this is an important turning area. 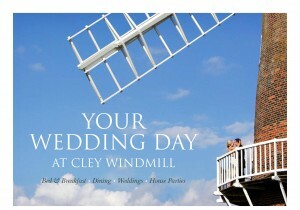 There is also a free car park at Cley Village Hall which has a pedestrian thoroughfare to the Windmill. If you are unable to arrive before 9.00pm, please let us know in advance and we will arrange for keys and directions to your room(s) to be left out. All our rooms are ensuite. They also have TVs although we do ask residents in the “round rooms” to use the headphones provided. All rooms have kettles and your basket of tea and coffee will be replenished every day. 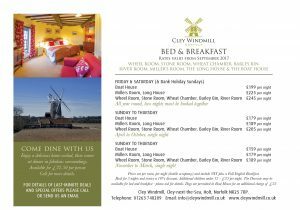 Small children and babies: we are very happy to welcome families with young children to the windmill but hope you will understand that some of our rooms are not suitable (sound-wise) or large enough (cot-wise) to accommodate you. Wheel, Stone and Wheat are best visited by couples! We have a high chair for the dining-room but are not able to provide a cot. If you need to ‘stay in touch’ you are most welcome to use our free wireless internet access. There is also connectivity in the gardens. Newspapers: there is a chap in Cley who sells Sunday newspapers from his sitting-room window! 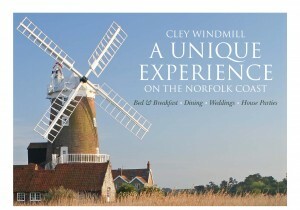 The nearest newsagents are either in Blakeney or Holt. Celebrating a special occasion? 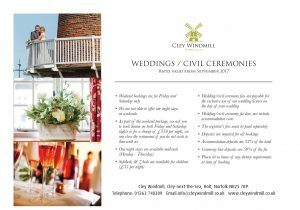 Just let us know and we can arrange to have a bottle of champagne or wine left in your room or put on your table at dinner. We can even arrange with a local florist to deliver flowers of your choosing.